*This post has affiliate links, which means we receive a commission if you decide to purchase through a link we provide, at no extra cost to you! 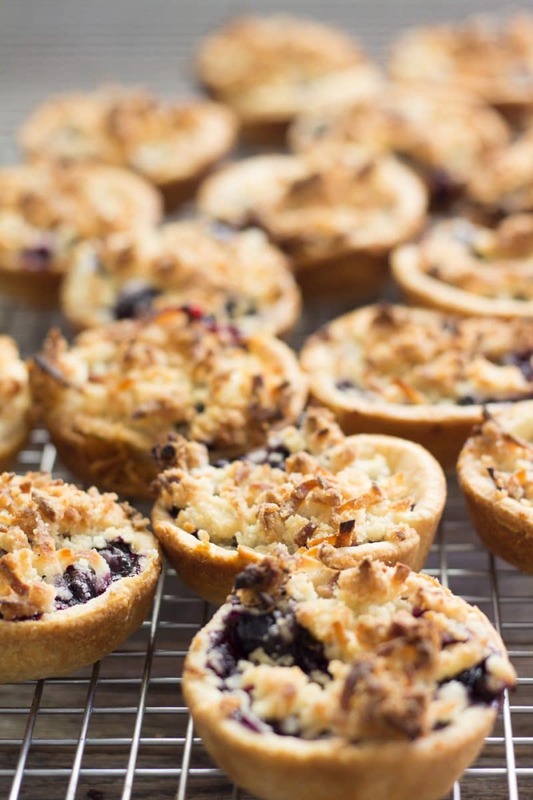 Recipe for the perfect 2 bite Blueberry Tarts, using fresh or frozen blueberries, with a crunchy coconut streusel topping. Anyone who knows me, the real me, knows that I can’t just leave a recipe alone. I add this, take away that, increase this and decrease that. Sometimes it’s successful, sometimes it is a complete disaster. Yes, even food bloggers have bad hair days in the kitchen. Sometimes the bad hair day is literal when you create some great recipe only to find a hair taking a leisurely swim in your dish. With any luck, you found it BEFORE the photo shoot! Once I even served general’s chicken and the DH was mortified, I had completely forgotten to put the sugar in. I even had the sugar canister near the stove. I carried it back to the pantry without another thought until we ate it. Accidental kitchen disaster, but that was just nasty. 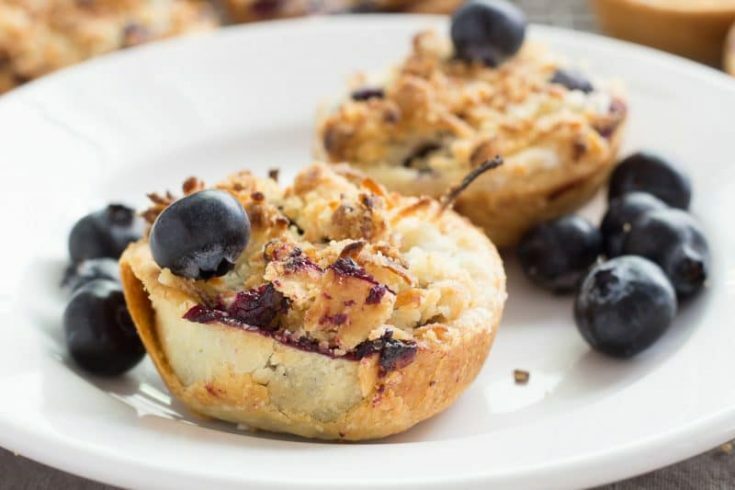 These Blueberry Mini Pies are no exception to my cooking addiction. I started with this a recipe from Pillsbury and made it a few times. Changes to filling versus crumb topping and the actual size of the mini pies are what seems to work best for my needs. It allows me to share my kitchen love with more people and is small enough there is no wasted food for those who want “just a small piece”. We all know a few of those types. Don’t be surprised though if they eat 2 Mini Blueberry Pies. They really are not more than 2 bites, maybe 3. 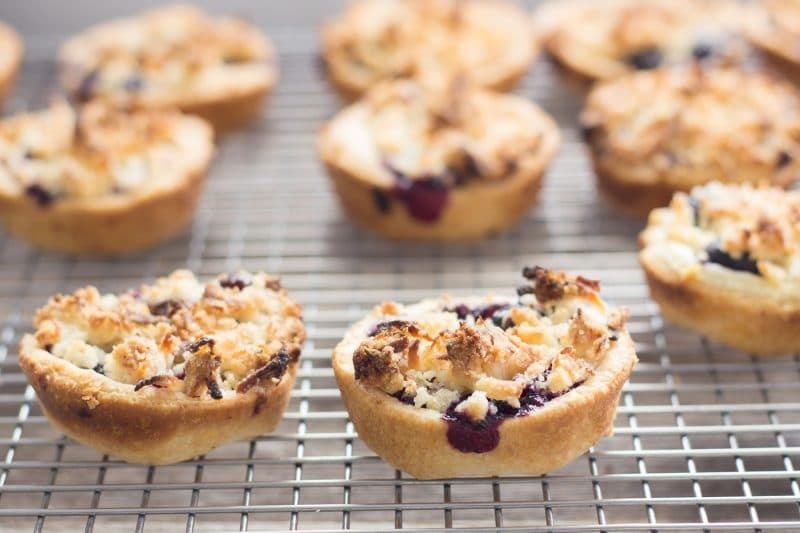 2-bite Mini Blueberry Pies, using fresh or frozen blueberries, with a crunchy coconut streusel topping. 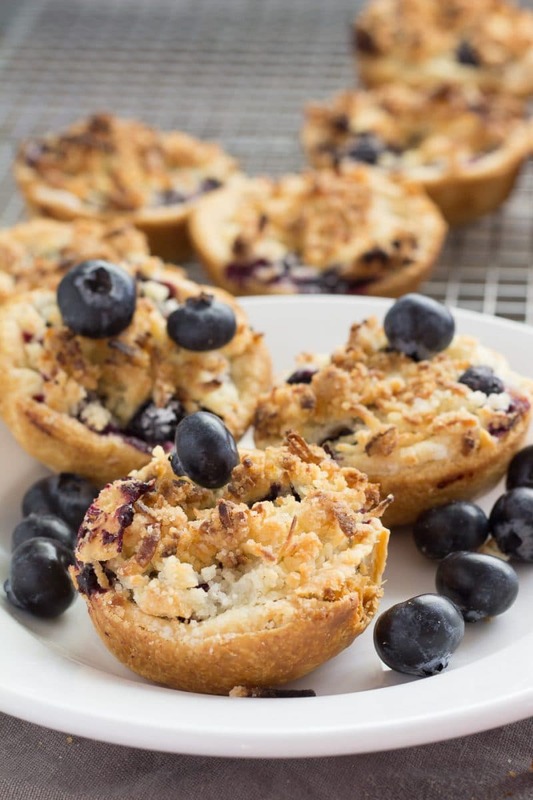 Perfect blueberry treats for picnic and tailgating. Soften pie crust, following package directions. 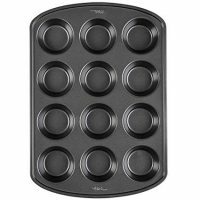 Spray muffin tin with baking spray and set aside. Unroll pie crusts on lightly floured surface. Use a 3 1/2 to 4 inch round glass or cookie cutter and cut as many rounds out as possible. I usually get 12 to 14 depending on glass size used. 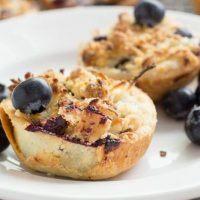 Place pie crust rounds into cups of muffin tin and gently form mini pie crusts. In a bowl, mix blueberries, 2 tablespoons of white sugar, and cornstarch. Evenly place blueberry mixture into mini crusts. There will be sugar and cornstarch in the bottom of the bowl. Evenly sprinkle this over the mini pie filling. Combine remaining 3 tablespoons of white sugar, flour, and coconut in a separate bowl. Toss to combine. Add melted butter to flour and coconut. Mix until large crumbs form. Sprinkle evenly over pie filling. Place in 350 degree F oven for 25 to 30 minutes or until crumb topping is brown and filling is bubbling. Remove from oven. Cool for at least 5 minutes. 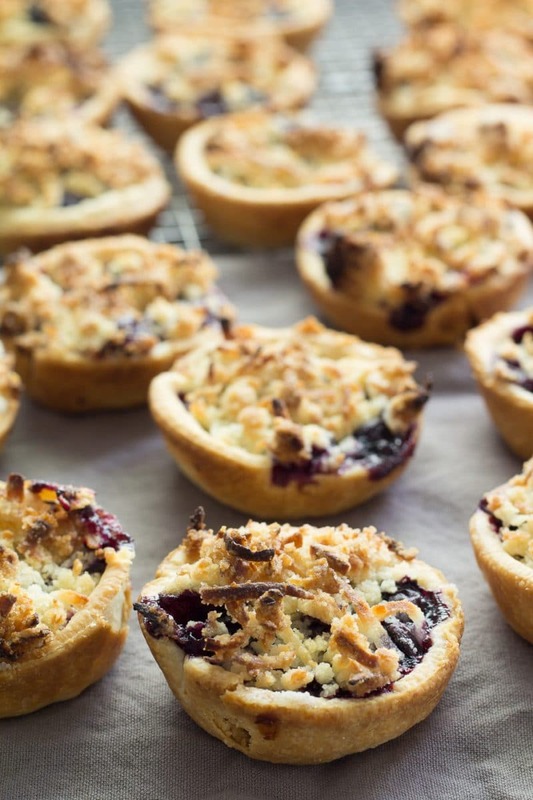 Loosen pies from muffin tin. Remove from muffin tin and cool completely, or serve warm with ice cream. As an Amazon Associate and member of other affiliate programs, we earn from qualifying purchases. We are a participant in the Amazon Services LLC Associates Program, an affiliate advertising program designed to provide a means for us to earn fees by linking to Amazon.com and affiliated sites. Hi! Thanks for visiting Pear Tree Kitchen! I'm a self-taught cook and I've been creating recipes for over 40 years. I hold a registered nurse license so forgive me if I go overboard with the food safety tips! My favorite things are chicken soup, just about anything that resembles a dessert and sharing recipes. The streusel is our favorite part! These are so cute! 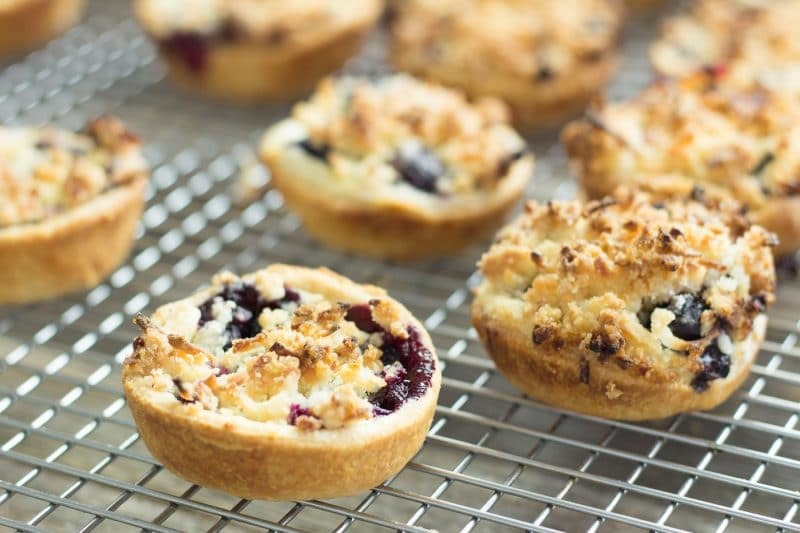 I love anything with coconut, the streusel sounds so good. Subscribe to Be Notified of Our Latest Posts!